RADIATE SPEAKER--Sr. Nancy Usselmann, F.S.P. St. Dominic's Church Nave, 7:30 PM. Free Admission. Presentation followed by reception in Parish Hall. **Special followup workshop on social media and evangelization w/ Sr. Nancy the following day (Saturday) in St. Dominic's Parish Hall. For our annual St. Dominic's Radiate Conference, Sr. Nancy will ask: How can we live our faith within the secular popular culture? It is about being mystics who see God's grace present in all human longings and desires and offer the culture a soul. We can be that transformative presence in the world today, if we reflect on our incarnational and sacramental imaginations, letting Christ speak through us for a culture that seeks communion, connection and purpose. 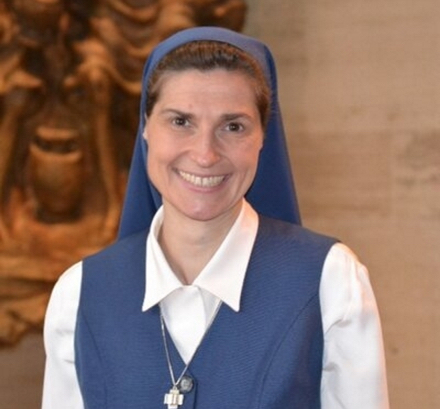 Sr. Nancy is the Director of the Pauline Center for Media Studies and a Media Literacy Education Specialist. She has degrees in Communications Arts and a Masters in Theology and the Arts from Fuller Theological Seminary. She has extensive experience in the creative aspects of social media, print media, radio and video production as well as in marketing, advertising, retail management and administration. Sr. Nancy has given numerous media mindfulness workshops, presentations and film retreats around the country to youth, young adults, catechists, seminarians, teachers and media professionals helping to create that dialogue between faith and media. She is a member of NAMLE (National Association of Media Literacy Educators), SIGNIS (World Catholic Association for Communicators) and THEOCOM (Theology and Communications in Dialogue) and board member of CIMA (Catholics in Media Associates). She is the author of a theology of popular culture called, A Sacred Look: Becoming Cultural Mystics from Wipf & Stock Publishing. Sr. Nancy is a theologian, national speaker, blogger and film reviewer.